Georges Danton, Camille Desmoulins, Maximilien Robespierre, Louis Antoine de Saint-Just: figures who played a key part in the prosecution of the Reign of Terror in revolutionary France. Each ultimately fell under Madame Guillotine’s blade. And all, including his eponymous tragic hero, feature in Gottfried von Einem’s historical operatic melodrama, Dantons Tod (Danton’s Death). Given our fascination with the time and place of the French Revolution, it is surprising how very few composers, before Einem, set their operas in the period. Giordano’s Andrea Chénier and Massenet’s Thérèse come to mind. The real Chénier however was a minor player in the story of the revolution; Thérèse, entirely fictitious. Einem’s characters were all drivers at the centre of events. Premiered at the Salzburg Festival on 6 August 1947, Dantons Tod was the first new composition to be showcased at the festival following the end of the Second World War. 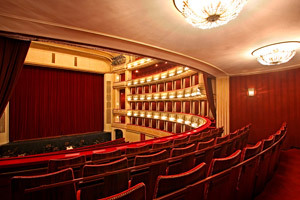 It is also a work that holds a special place in the heart of the Wiener Staatsoper; the orchestra at its first performance was the Vienna Philharmonic; its singers were drawn from the Vienna State Opera Chorus. The first act of the opera focuses on Danton’s confrontation with Robespierre. Weary of the revolution’s bloodlust, Danton and Desmoulins demand that the killing stop. Robespierre and Saint-Just, determined to quash any resistance to the revolution’s momentum, simply have their colleagues arrested. In the second act, Einem’s genius really lets fly. In a show trial pitching individual against the mob, Danton gives a display of bravura singing that perfectly conveys his attempt to sway the court's decision. Then, after the executions, there is the astonishing sight and sound of Lucile, Desmoulins’ wife, on the scaffold lamenting Danton and her husband’s deaths. Einem wrote in a highly individual style, which he defended resolutely. One suspects that at some level he found a personal connection with his protagonist: both men were ready to argue for what they believed in. The result in Dantons Tod is music that is not just a joy to hear but which has a sincerity in it ideally suited to the opera’s story.